The second British invasion of North Holland began on Tuesday when we disembarked from the ferry without a shot being fired and drove north to the towns of Castricum, Alkmaar, Krebbendam, Calantsoog and Shagen. Facing little opposition from the Batavians and without any sign of the French we were able to park up and mooch around each of the towns. 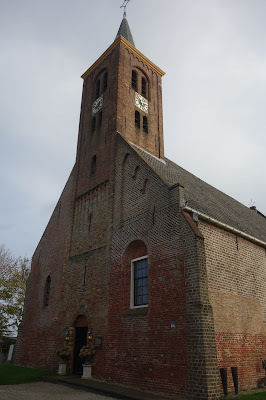 After one false start we found the church that features in the painting of the Anglo-Russian defeat at Castricum. It has been added to since 1799 but it was easy to figure out its original configuration. Also, a local confirmed it for us. 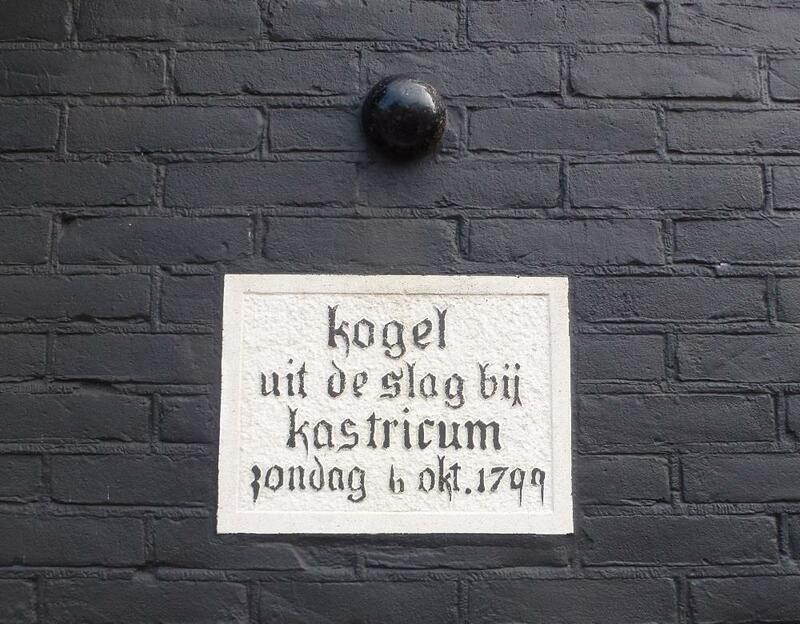 There was also 'het huis mit der kogel', embedded during the battle. We are trying to sell our place at the moment and wish we could say we had a feature wall with cannonball! A painting of the battle of Castricum showing the church. 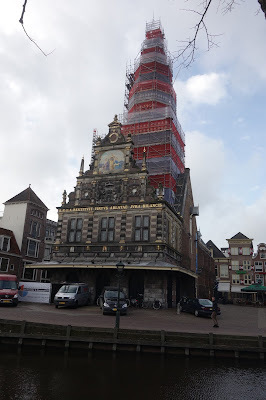 On to Alkmaar, it is a very lovely old town, even if the ring road was annoying. 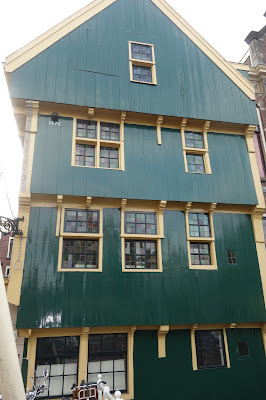 We found another 'het huis met de kogel' or the house with the bullet in this case. 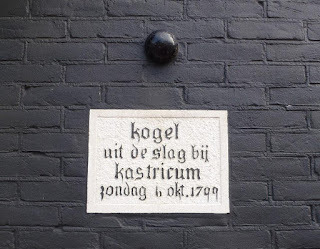 It is actually a large cannonball embedded in the side of a house from the time of the 1557 siege of Alkmaar by the Spanish. 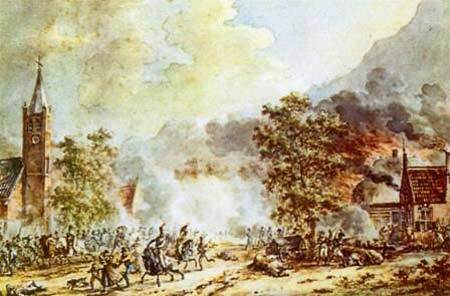 Nothing to do with 1799 but Alkmaar did see major combat during the Helder campaign, as part of a large sprawling battle that culminated in the defeat at Castricum. Anyone with Hovels 28mm European houses should find the next pictures of interest. I have half a dozen to do. Moving on, Calantsoog is at the southern end of the beach that the British carried out their opposed seaborne landing from a flotilla of small boats. What struck us at once was the sheer size of the sand dunes, which dwarfed the houses in the current town and in 1799 were reportedly around 50 and up to 300 feet high in places. Our visit was on a nice sunny but very breezy day and the sea was cutting up pretty rough. The landings took place in August but the weather had not been good so it was easy to imagine the troops struggling ashore in heavy seas. 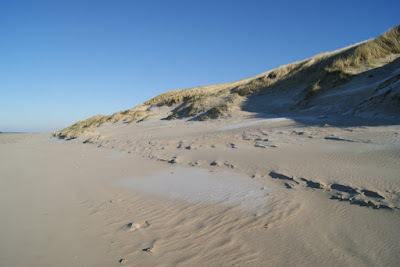 These sand dunes are enormous and extensive, running for miles along this coastline both north and south. Some were heavily wooded, but most were not, and were broken up by numerous cuts and defiles through and around several lines of dunes with clumps of horrid razor grass all over the place. 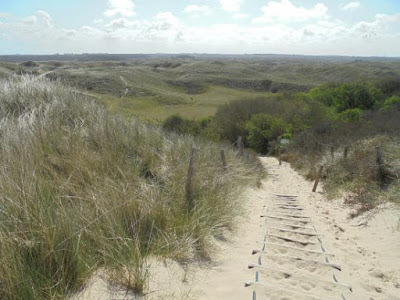 I was brought up on the coast near Blackpool and am familiar with navigating seemingly vast (when you are 11) tracts of dunes without anything upon which to register on in terms of direction, etc. (Apart in my case for Blackpool Tower). The troops must have found it heavy going, advancing in the face of dogged if futile Batavian resistance, unable to maintain contact with units to either flank and being forced to break up into smaller units to get round or over the dunes. What is more, most of the land to the east of the road running parallel to the sea was subject to tidal flooding, and there was a massive part man-made, part natural feature running parallel to the beach called the Zande Dyke, so the area of operations was very restricted, reduced even further by more dykes and so forth which hampered the British advance and Batavian reinforcements. Indeed the whole area today is covered in polders and dykes which in 1799 would not have been so well developed, leaving the terrain extremely difficult to traverse, and wet. What was also in evidence and came home to me while we were travelling was the very small area over which the campaign was fought. Advances were measured in almost WW1 terms. 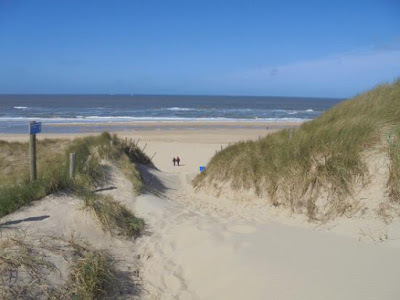 After the early success of the landing everything went downhill and after a number of attempts to push south, despite some success, the Allies were finally defeated at Castricum and forced to negotiate the terms by which they would depart Holland. The evacuation of the Allied army from Den Helder. I did take some more photos but for some unknown reason they won't upload to the blog. We shall be returning in the New Year to finish our explorations. Most enjoyable travelogue of your journey. Relieved to read you faced little opposition on your march inland. Some lovely photos and really good to walk a battlefield, which helps you understand how and why the action developed. I plan to do this next week at the ECW Battle of Lansdown, just outside of Bath. Grand travelogue there Colin, most enjoyable as well as informative. The dunes somehow surprised me, I don’t know why really, and the photo of the houses pleased me as my own are not too far off the style. Will you be doing a report on Crisis later? Lovely to read of your trip Colin. As others have said it’s a great travelogue for what is a charming part of the country. Great to see the modern pics next to the map. The cannon balls do add character don't they!